On these Thursdays, we will meet and eat together in “sognehuset”, Gormsgade 19, 7300 Jelling. Those who want can bring a dish and we will refund your expenses. 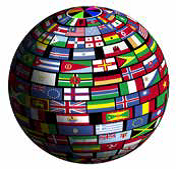 We will sing together – maybe an English hymn or a Danish song. November 24th we will make Christmas decorations. For those who want to, we will share communion afterwards in Jelling Church, conducted by Pastor Birgitte Møldrup. We are finished by 7.30 pm. International service with communion in Jelling Church conducted by Pastor Birgitte Møldrup. Afterwards there is “æbleskiver” and a “package game” in sognehuset, Gormsgade 19, 7300 Jelling. All asylum seekers and locals are very welcome! Hver måned er der enten gudstjeneste (søndage kl. 14.00 med altergang) eller ”Eat & Sing” (Torsdage kl. 17.30). Der kan alle medbring mad, og vi vil dele de forskellige retter. Efter det synger vi i kirken for dem der vil. Alle der kommer med mad får refunderet deres udgifter. Kontakt Ellis 26212407 eller Christophe 71412114 hvis du tager mad med. Præsterne Birgitte Møldrup og Jette Langgaard, tidl. Thyregod, og diakon Christophe Ndikouriyo, leder gudstjenesterne. Sproget vil være engelsk og dansk. De internationale gudstjenester og ”Eat & Sing” er et mødested for alle aldre og nationaliteter – også danskere, der ønsker at være sammen med mennesker af alle slags, men forenet i Guds kærlighed – i kirke og sognehus. Every month there is a Sunday service (Sundays at 2 p.m. with communion) or “Eat & Sing” (Thursdays at 7.30 p.m.). Everyone is invited to bring some food, and we will share the different dishes. After that, we sing in the church for those who would like to participate. Those that bring food, will have their expenses refunded. Please contact Ellis 26212407 or Christophe 71412114 if you bring food. 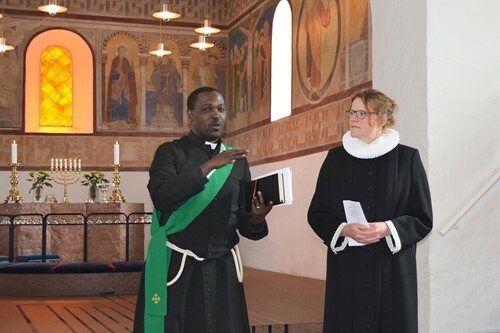 The pastors, Birgitte Møldrup, Jette Langgaard and deacon Christophe Ndikouriyo, are conducting the service. The language is English and Danish. The Sunday services and “Eat & Sing” are meetings for all ages and nationalities – Danes too, who want to be meet with people of all nationalities, united in Gods promise - in church and when we eat together in “Sognehuset”.